Pop-Up Card – A New Technique! Hi there, stamping friends! I hope you’ve enjoyed your week; I can’t believe the first week of August is already done! I had a great day yesterday – I got to spend some quality time with my sister and brother in law 🙂 We went to the gorgeous Queen Elizabeth Park here in Vancouver, B.C. – even with our drought and water restrictions, and the gardeners having to hand water acres of plants, the gardens look amazing! What else was fun is that they have a temporary Zip Line set up in the park; you ‘fly’ from the highest point in the park, over the main centre, and to the small quarry garden landing zone. Glenn (my B.I.L.) & I took the ride – and it was such fun! I thought the ride was too short – literally only 20 seconds, because you go quite fast – but I really enjoyed it! I thought Glenn was just a trooper, because I didn’t realize that he doesn’t really like heights; a fact he didn’t mention until we were all harnessed in, and about to go zipping! Fay (my sister) was not feeling too thrilled with the idea, so she filmed our little ride 🙂 It really was safe; I didn’t feel worried about it at all; just a few butterflies in the tummy when you first leave the platform, which is about 400 ft. up! I’m having trouble transferring my photos from my iPhone to my PC; as soon as I get that sorted out, I’ll share some pictures with you! 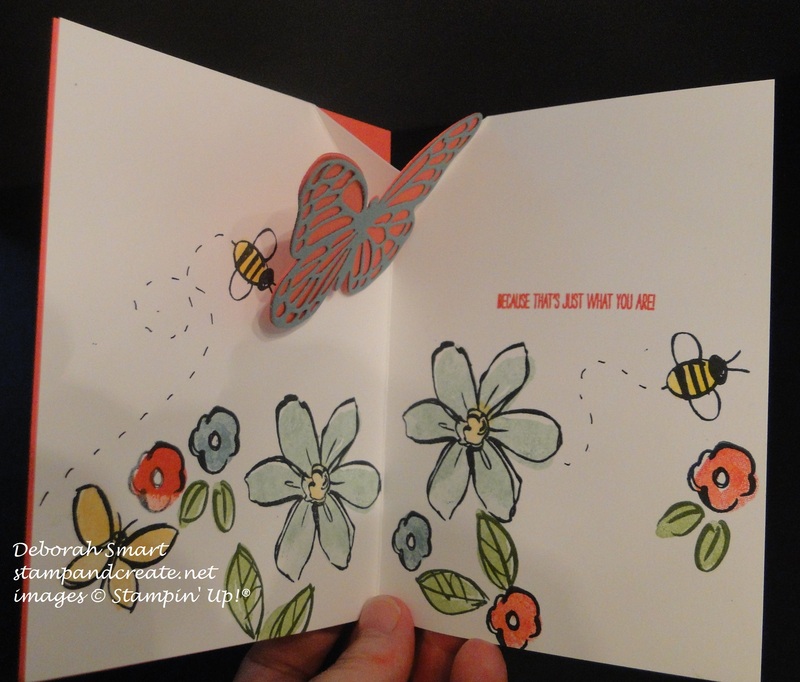 Speaking of butterflies – I made this card that I am absurdly happy with! I found a tutorial by the wonderful Brenda Quintana, another SU! demonstrator, on how to make a pop up card; I adjusted hers a bit, to make a full sized card, and this is what I created. This is the front of the card. You can see I’m still having fun with the Garden in Bloom stamp set – it really is just too much fun to simply stamp the images, add the colour stamp to fill it in – and have it look like you spent ages watercolouring! I stamped the images onto a panel of Whisper White cardstock, using Memento Tuxedo Black ink for the flowers & bee outlines. I then used Watermelon Wonder ink for the inside of the small flowers, and Lost Lagoon & Mint Macaron for the large flowers. The leaf outlines were stamped in Mossy Meadow ink, then the inside stamped with Pear Pizzazz ink. 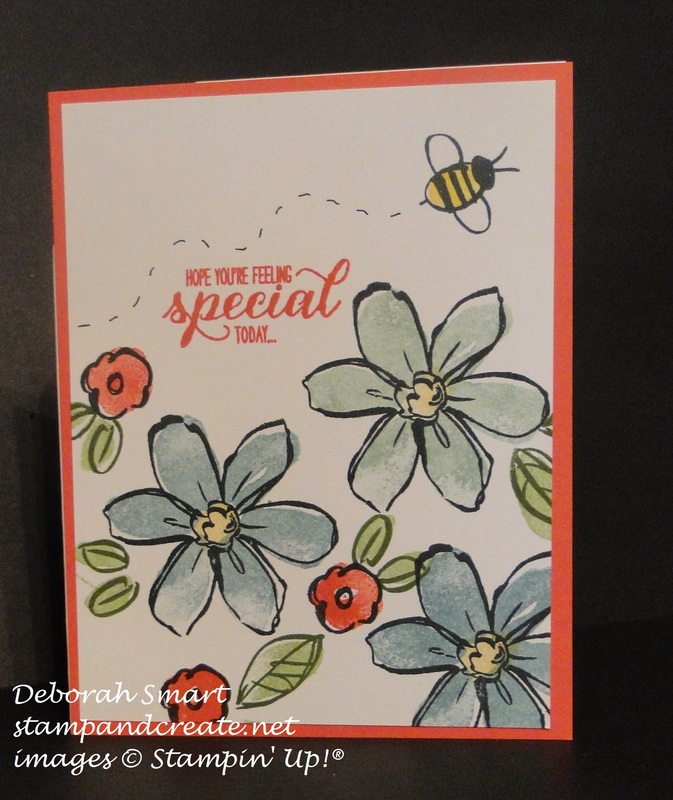 The bumble bee inside was stamped using Daffodil Delight ink, and the sentiment stamped in Watermelon Wonder ink. I then used Tombow Multipurpose Glue to attach it to a panel of Watermelon Wonder cardstock. How cute is this?!! (yes, I’m happy with my card! 🙂 ) I repeated the flowers and bumble bees the same as on the front, and added a small butterfly in Daffodil Delight ink in the bottom left corner. The ‘flight paths’ of the bumble bees was done by hand, using the thin end of a Basic Black Stampin’ Write Marker. 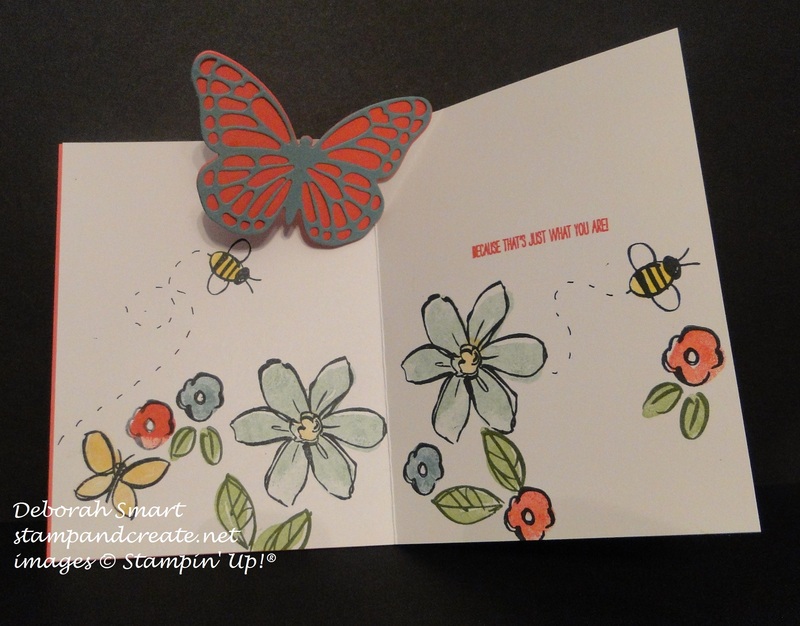 The pop up butterfly is die cut using 2 dies; the full background butterfly is cut from Watermelon Wonder cardstock, using the Bold Butterfly Framelits, and the intricate top butterfly is cut from Lost Lagoon cardstock, using the Butterflies Thinlits Dies. I think this type of pop up is too stinkin’ cute, and I know I’ll be doing lots more of this technique! I’ll be making a tutorial for you on how you can make these cards too; it won’t be until next week, as this weekend is more family time – this time we’ll all be celebrating my brother’s birthday! Also coming next week is my pre-order from the upcoming Occasions holiday catalogue – I can’t wait to get those goodies, and start creating with them!! I’ll definitely be basing some classes around the amazing kits & bundles – you’re going to love them! In the meantime, if you’d like to purchase any of the products I used in making this card, just click on the image(s) below, and you’ll be taken directly to my online store. Or, just give me a call or email, & I’m always happy to place your order for you! 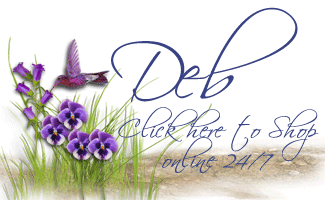 Deb, I love your butterfly card !